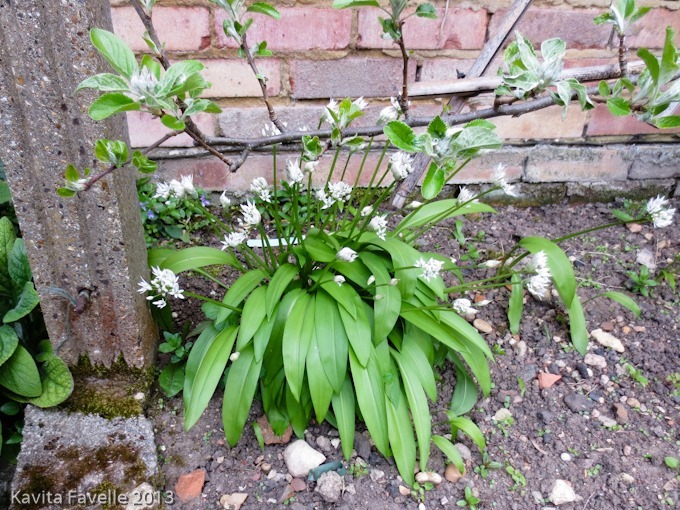 I’ve blogged about wild garlic aka ramsons aka allium ursinum aka bear’s garlic before. 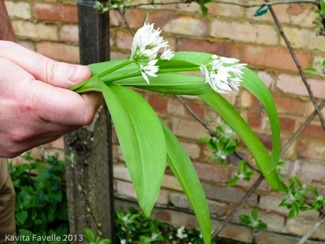 A wild relative of chive with a strong garlic flavour, it’s native across Europe and Asia. The ursine botanical name and nickname come from the brown bear’s love of the pungent bulbs, though there are no such bears in my favourite foraging spots! This year, we need go no further than our back garden, having transplanted a few plants from my friend FoodUrchin’s backgarden. 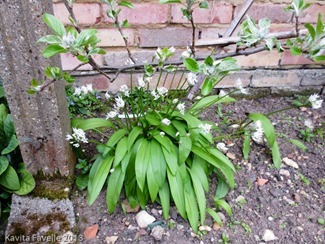 He has become the ramsons-pimp of the South East. A simple way to enjoy some of your wild garlic harvest is to make a seasonal mashed potato; it’s a little like Irish colcannon. Just add chopped or torn wild garlic leaves (and chopped flower stems too, if your plant is flowering – they have the strongest flavour) to your normal mashed potato recipe. We add butter, milk and a little seasoning to ours. 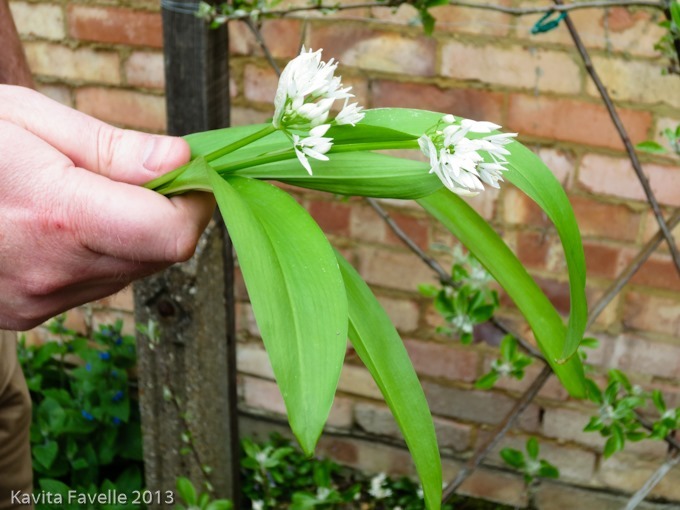 If you have a generous supply, here’s a simple way of preserving wild garlic for use all year round. 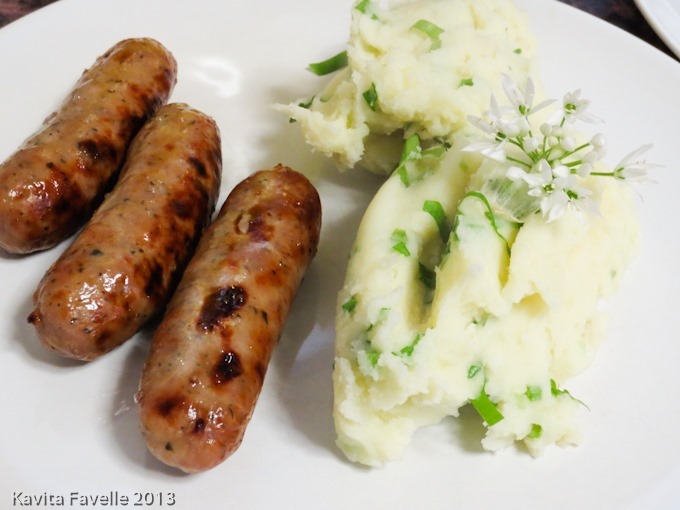 9 Comments to "Wild Garlic Mashed Potato"
i can’t believe i’d never thought of this, what a brilliant idea… I know what i’m having this weekend! I bloody love wild garlic and am very proud that on her camping trip this week Amy foraged some and gave it to her teacher to cook with that evening! There is a huge wild patch on a public path near us. I might have to go dig it up!! Love that! Good girl, Amy! P.S. Those sausages looks delicious too! Yes, some places it’s so much easier to find! Have some in my back garden now!! Oh my goodness I love the sound of this!